Tacos are incredibly delicious, in fact they may be one of the best foods ever invented. If you are used to corn tortillas and refried beans, sometimes it is hard to make the Paleo switch, but this recipe will show you a different way a taco can be. So forget the crunch, and get your soup on instead. The flavors of Mexico are still in there, and they will tempt your taste buds with every spoonful. 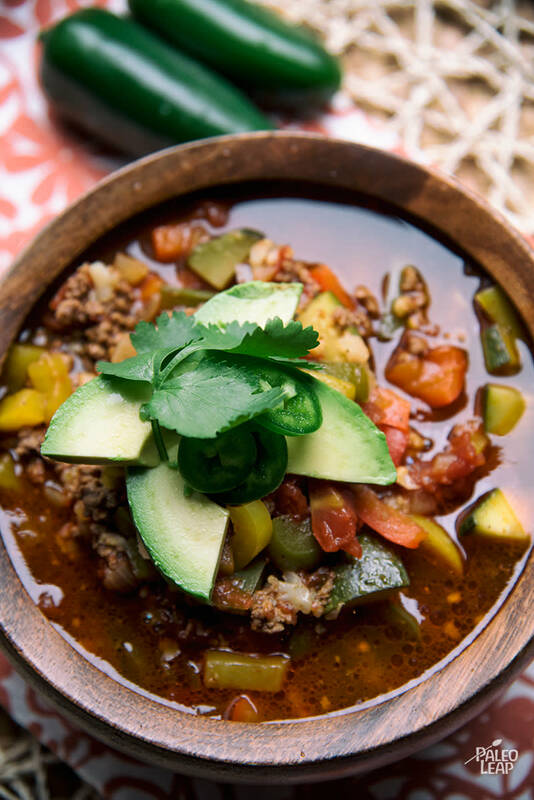 This taco soup takes about an hour on the stove, but could easily be made in a slow-cooker to have it bowl-ready when you come home from work or school. However you decide to make it, don’t skimp on the ingredients, follow them in order and make sure they are plentiful. If you enjoy life on the spicy side, you can add an extra jalapeño to the pot, or rather chop it up fresh on the side and let everyone add their own. A little dollop of coconut cream on top? Yes, please! The amount of ground beef is plentiful in this recipe, and this turns it into a thick, stew-like soup, but you can change it up however you like. Add a little more beef stock to thin it out, use chicken instead of beef, toss in a sweet potato or two for a creamier version, and – by all means – be sure to make a fresh lemonade with thyme to sip between the spicier bites. Heat the cooking fat in a large saucepan over medium-high heat. Add the garlic and onion, and cook 2 to 3 minutes. Add the ground beef and brown 4 to 5 minutes, stirring occasionally. Sprinkle all of the spices over the meat. Season to taste and mix everything well. Add the zucchini, bell pepper, tomatoes, and jalapeno to the saucepan. Pour in the tomato sauce and beef stock; give everything a good stir. Cover, lower heat to medium, and let simmer 20 to 25 minutes. Adjust the seasoning, and serve topped with fresh cilantro and sliced avocado.